Different from coconut milk and coconut oil, the clear liquid inside young green coconuts is what we call coconut water. This fat-free, cholesterol-free beverage is loaded with vitamins and minerals for a refreshing yet natural way to quench your thirst. Although the drink isn’t quite the magical cure-all it’s made out to be by marketing executives, coconut water may still serve a purpose in the day-to-day of your life. 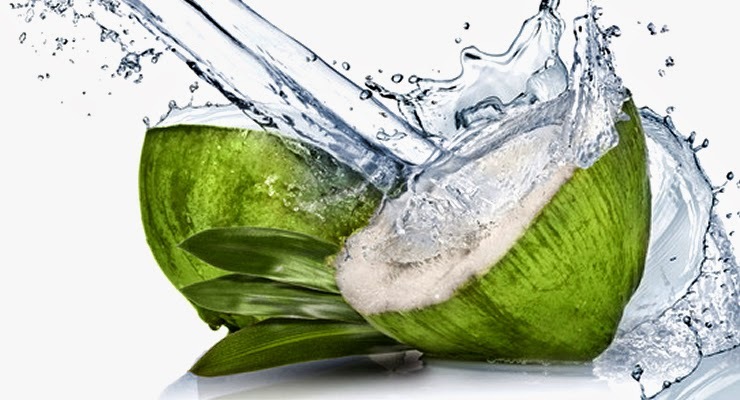 Here’s a realistic look at coconut water health benefits. Although there is no conclusive scientific support to the claims that coconut water can hydrate better than regular tap water, the fruity drink can still serve the purpose of keeping your body hydrated. If you’re one that has trouble drinking eight glasses of water a day, you may be interested in supplementing a cup here or there throughout the week with coconut water. An eight-ounce glass of the fruity drink has around forty-five calories so it’s certainly not high in calories, but it also isn’t a true freebie like water is. If you’re drinking coconut water as an occasional hydrating treat instead of a sugary soda, great. If your plan, however, is to make coconut water your new go-to beverage for anytime you’re thirsty, you can easily start to down a few hundred extra calories a day and see the negative results in the mirror and on the scale. As an everyday substitute for regular water, coconut water just won’t cut it. The sports performance branch of the dietary supplement industry is brimming with pre-workout and post-workout options to replenish the body for endurance and recovery. Like some sports drinks, coconut water actually contains potassium, sodium and sugar. An eight-ounce glass from Vitacoco offers 470 milligrams of potassium, 45 milligrams of sodium and around 11 grams of sugar. A popular sports drink like Gatorade, on the other hand, provides 30 milligrams of potassium, 110 milligrams of sodium and 14 grams of sugar for a 50-calorie serving of eight ounces. For both options, the calories and carbs are fairly comparable, but as you can see, there is a huge difference in the number of milligrams of potassium and sodium. If you’re downing a sports drink during a serious and intense workout, you may be inherently interested in having a bigger dose of sodium than the skimpy serving provided by coconut water. On the other hand, if you’re performing a mild workout and just want some assurance that your body isn’t totally depleted, the nutritional value of coconut water may serve you well. Most of us who engage in moderate physical activity don’t really need to down a full sports drink anyway and coconut water additionally provides small amounts of calcium, magnesium and phosphorous. The electrolytic effect can still prevent muscle cramps and spasms, aid nutrient absorption, promote nervous system functioning and support the immune system. Although the research is too sparse to warrant drinking coconut water for the sole purpose of preventing hypertension and heart disease, coconut water may have a positive influence on heart and blood vessel health. Studies have shown that coconut water can help reduce both systolic and diastolic blood pressure values. In this context, coconut water sometimes gets claimed as promoting kidney health as well since high blood pressure can damage your kidneys. Additional heart-health benefits may also come from regular consumption of coconut water in regards to cholesterol. In animal studies, coconut water has also been shown to reduce LDL cholesterol and increase HDL cholesterol for a better overall ratio. Follow-up trials with humans, though, should be performed before assuming that the fruity water can have the same influence on people. When looking to include coconut water into your diet, you should be aware that there are plenty of unnatural options available on the market today. If you’re not careful, you may end up coming home from the store with a coconut-flavored drink that has been loaded up with extra sugar and artificial chemicals. Where possible, stick to a coconut water that has no added sugar. To act as a healthy beverage, your coconut water should be plain and unflavored with no more than fifty calories per serving. Some coconut water options have an other ingredients section that lists something like “less than one percent natural fruit sugar” and added vitamin C. These picks can still be labeled as “pure coconut” since the sugar is naturally derived. Realistically, this kind of add-in differs little from a manufacturing process used in the case of something like orange juice, which also requires an add-back-in policy of natural orange byproducts after the original oranges have been pasteurized. If you’re comfortable with the less-than-one-percent policy, great. If you personally want to exclude those kinds of picks, great. Settle on whatever coconut water option serves you best; the choice is yours. If you want to start budgeting coconut water into your daily calorie log to reap any potential health benefits, doctors agree that one or two servings a day is all that would be needed. In clinical trials, a daily eight ounce serving is often all that is consumed by participants. Studies often take place over the course of three months so that before and after levels can be properly compared. If you’re really interested in what coconut water can do for you, be sure to talk with a medical professional about your plan to use the drink as a daily supplement if you have any fears that the potassium or sodium additions, for examples, may have a negative effect in your personal situation. If you are pregnant, nursing, on medication or have any serious health condition, you should be particularly cautious when implementing a new dietary habit into your lifestyle. 0 Comment for "Health Benefits of Coconut Water "